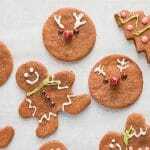 Easy vegan gingerbread cookies that require only a few ingredients are easy to roll out, and taste scrumptious! Grain-free, gluten-free and dairy-free. Icing recipes included. Place all the dry ingredients in a mixing bowl and whisk to combine intentionally trying to eliminate any lumps. Add the rest of the ingredients and stir until combined. Using hands is an easy way to mix the dough. Roll dough between two pieces of parchment paper. Cut out cookies and place on parchment lined baking sheet. Bake for 8-10 minutes until firm to the touch. *See tips/notes below. Depends on the size and thickness of cookies. Let completely cool before icing. Icing recipes in the post. I made my cookies on the thin side, but you could also make thicker chewier cookies. Completely cool cookies before icing. Use light-colored molasses for lighter cookies. I used blackstrap molasses which yields a darker cookie. Check smaller and thinner cookies prior to 8 minutes, say at 5 minutes so you avoid burning the cookies.